On March 3 the developers will lock the doors and we have to leave. We found out on Saturday. The rubbish is already taking over the hallways – old chairs, shelves, books, tins of paint, plastic bags and various wooden sticks and metal bits. The people next door left this weekend. The building is quiet. The bathroom and the corridors already have that cold, slightly metallic scent of abandonment. Soon there will be no more artist studios on Cremer Street. The developer called us an “eyesore on Hackney Road”. And perhaps he was right. This is a crumbling sixties warehouse with graffitied walls, dirty windows and family of stray cats. It doesn’t fit with the new wine bars or the brand new apartment blocks with their straight walls, small windows and box-like flats selling for £600,000. Soon this asbestos roof will be torn open and the walls chewed to pieces by bulldozers. I’ve seen it happen to the old council blocks up the road. I watched as the front of one of the buildings came down and a bedroom or living room with bright green walls gaped out over Hoxton like in some disaster movie. That was once someone’s home. In a winter the old buildings were gone and it’s been a year since people started leaving plant pots on the balconies and bicycles outside the new apartments. This was always going to happen to the studio building on Cremer Street. The pub with the English flags in the windows was turned into a wine bar. The boarded up one that used to stand on the corner was demolished before I came here, but is still there on Google Street View like a digital ghost. Small shops selling wholesale bags and shoes are being turned into cafes. The gay club has been shut down. The derelict Georgian terraces have been renovated and decorated to smug perfection. The old hospital is being turned into expensive apartments. The boards around the building site show photographs of the people that might one day live there. Pretty, shiny haired people hanging out on Brick Lane. Aspirational people. I sometimes wonder if these people are the new Londoners. The politicians talk a lot about “aspirational hard working families”, although no one seems to know who or where these people can be found. London itself is aspirational. The tallest buildings are reaching for new heights, the house prices climbing upward with them. Whoever you are there will always be someone with more money than you, a car more expensive than yours and an apartment more expensively furnished than yours. In this city we’re often reminded that the ladder stretches far above us. But this aspirational London is not the town I want to live in. I’d like to call this place transitional, always changing, always in motion. London has been burned down, bombed and demolished several times over the last 2000 years. It’s always being rebuilt, the old torn down to make way for the new. But like a magic trick, the city never changes. In the midst of all of this turmoil some buildings have managed to escape the bombs and the bulldozers. 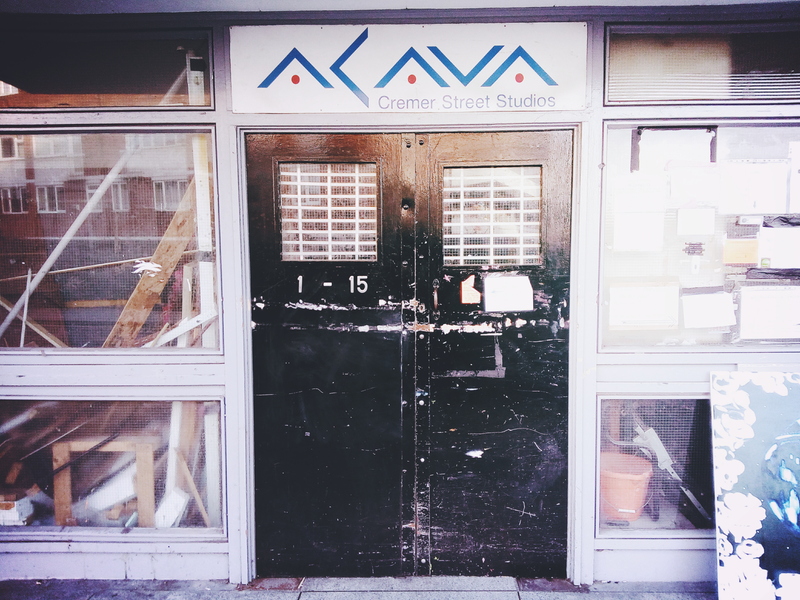 Cremer Street and Hackney Road will still be there when the studio is gone. The map will look the same. Some of these roads were built by the Romans. When this building is gone the stray cats in the studio car park will move on to another spot where people will feed them. The people who move into the new apartments will go to the same cafe we go to for their coffees. The trains will rumble along the tracks on the bridge over Cremer Street. The huge psychedelic graffiti eye on one of the tower blocks further into Hoxton will keep looking out over it all. We will move our studio south of the river and everything changes and nothing changes at the same time. But just so I remember there is a sticker next to the door that says “Do you wear enough black to be an artist?” I don’t know who put it there. Next to it is a stack of framed prints and screens and then the table which used to be used for screen-printing, but we now mainly use for eating lunches and packing web orders, although not at the same time. On the wall opposite is the fridge and the microwave that should have been cleaned four months ago. There is a shelf with tea and mugs and the plum vodka Gerry’s brother and his wife gave us and I swigged out of the bottle, whilst sitting on the printing table, one day after we’d had some upsetting news (it’s very tasty, thank you!). There is a shelf on the floor full of water-based paint and spray cans. Underneath the table are stacks of vinyls and screens. Next to the table there are two large and solid plan chests. Underneath the barred windows there is the Ikea sofa I accidentally broke when I bounced up and down on it after I heard that my book had been accepted by the publisher. Then there is our desk where Gerry and I face each other, it’s covered in papers, printers, random hard-drives and cables. We’ve scribbled messages on it. There is a sleeping fish that Gerry drew on a sticker and placed next to my laptop. Behind him is the year planner from 2015 and a huge Wall Street print that was damaged when it fell in front of the door and we had to bash the frame in order to get into the studio. Next to him is the Ikea shelving system with clothes rails stacked precariously on top of it and stock hanging below. Then there is the corner crammed full of stock boxes, hiding all the stuff that’s been forgotten about and kept out of sight. Behind that there are paintings, not ours, they were left here by the previous occupant who uses the studio for storage. This is it. The studio. Soon it will be empty and all we will have left are these memories. Brilliant writing. I hope that you and Gerry have a new place to set up.